The OECD pleaded this morning for more “coordinated action”, i.e., “stimulus”, without even bothering to explain why anyone would feel confident if governments around the world might actually oblige. This economy, the singular global economy, has been stimulated to death, awash in especially monetary influence of constant ZIRP and QE’s and now threatened by nominal punishment through NIRP. When all of that was first introduced, there were no doubts ever expressed that they wouldn’t work, at most these orthodox institutions would admit that there were only risks to their modeled success rates. Secondly, it is assumed that there is no increase in interest rates in 2009-10 as a consequence of the fiscal stimulus, whereas if interest rates did increase this would also tend to dampen multiplier effects both at home and abroad, involving partially offsetting negative spillover effects. Further fiscal actions would raise positive trade spillover effects, but also increase the likelihood of an adverse reaction from interest rates. There is a fundamental error at the base of all of this analysis and policy that dates back long before the Great Recession. Indeed, it is the very reason that the recession was so deep and critically uniform without regard to individual economic systems. The OECD, as any central banker, is unable (or politically unwilling, as the appeal to “make good on promises to current and future generations” advises) to make the small intuitive leap out of cyclicality and into common sense. 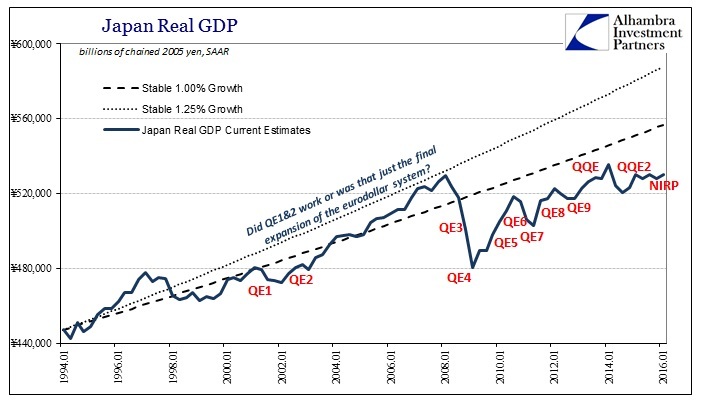 Under the “rules” of cyclicality, “stimulus” just works. On the fiscal side, there is a positive multiplier to whatever any government does, meaning that even the most inefficient projects like shovel-ready infrastructure (singled out as such by the OECD paper) are net positive; so much the better if the national central bank adds great monetary “accommodation” to the mix. With that happening in almost textbook fashion almost everywhere around the globe, there were only expectations in the earliest years of the recovery that though it would be a longer cycle it would still be a completed cycle. All economic projections have followed from those expectations. Each and every time the OECD, or any of these orthodox outlets, makes a projection just a few years into the future it always seeks out the prior baseline. 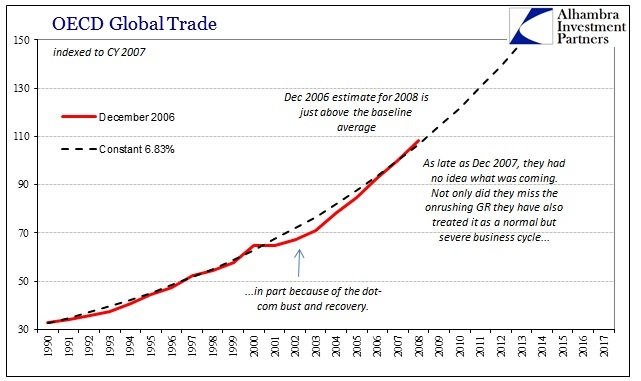 In terms of global trade, the average growth rate from 1990-2008 was 6.83% according to the OECD figures. 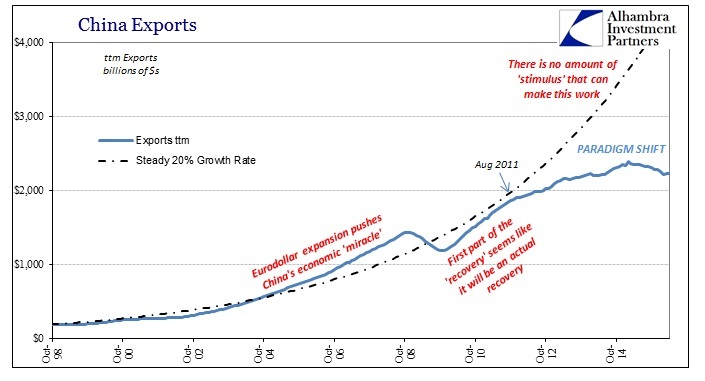 From the cyclical perspective, it makes sense that trade or GDP would mean revert even after the severity of the Great Recession – fully realizing that merely returning to the prior growth rate is not the same as full recovery, which must include above-average growth to make up for whatever was lost in the recession. The greater the time it takes for the recovery, the faster the catch-up rate must be. But rather than find that, we see only the opposite time and again. Orthodox models assume even after repeated disappointment year after year that the global economy will throw off the shackles of 2008 and burst into cyclical completion. That is what all those unrequited upturns in every projection series point toward. 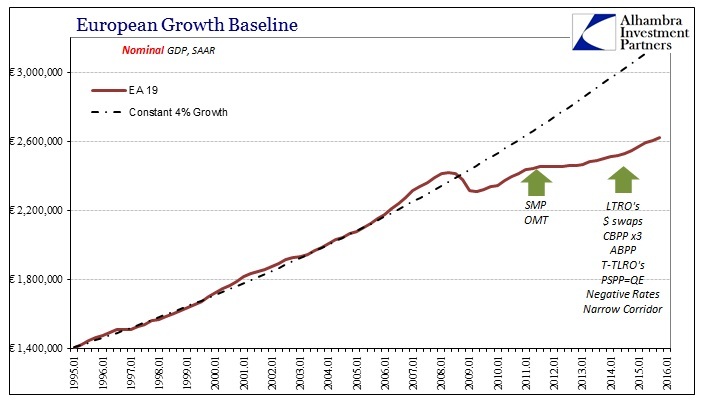 The OECD now calls this a “low-growth trap”, but it is mistake of ideological blindness. All evidence points to something other than a cycle, yet the global economy is treated as if it were still operating under the same foundation as the pre-crisis era needing only more time to and effort to sort out. The OECD claims the “right” mix of government policies will unleash the cyclicality, but fails to make any explanation as to why prior “stimulus” hasn’t done so to this point (we are supposed to infer that all prior “stimulus” just wasn’t the “right” version or amount). Once orthodox economists crack whatever magic monetary and fiscal combination code, we are supposed to believe the world is only then freed from the trap. Again, this view is simply an article of faith grounded in miscalculations particularly about what really happened in the middle 2000’s. As I wrote above, it is an error that dates back decades and covers the massive mistakes these same institutions and economists made leading up to 2008. 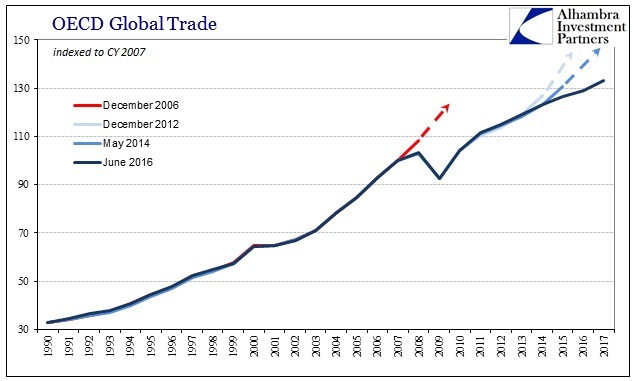 The above chart shows the December 2006 OECD projections for global trade. Even though the US had by then started on the course of the housing bust, the OECD models were still quite optimistic that it would not lead to any global alteration, even if it sapped some “demand” from the domestic US economy. 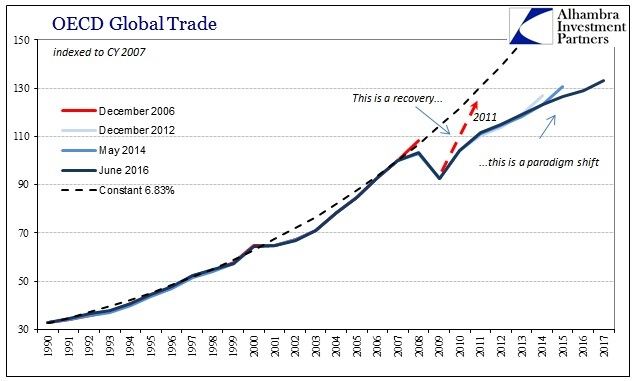 The projection for global trade in CY2008 was even slightly above the baseline as yearly growth was anticipated to continue at close to double digit rates in fully completing the cycle of the dot-com recession (which was also a global event) and recovery. Approaching 2008, the OECD, as any central banks especially the Ben Bernanke Federal Reserve, maintained little expectation of deviation from that trend. It wasn’t until the Great Recession was staring them squarely in their models that they were finally forced to reckon with the scale and seriousness. Even faced with what these same regressions figured was an impossibility, there was still no consideration of anything other than cyclicality. What has followed during this “recovery”, however, is irrefutable evidence that this is and has been no cycle at all; it is nothing other than a paradigm shift. As such, each expectation for full recovery can only lead to disappointment and more policy error. That was what happened in 2012 as what looked like the vague outlines of recovery up to the middle of 2011 suddenly and “unexpectedly” slowed yet again. Orthodox institutions all responded to this abrupt “bend” in the global economy in once more coordinated fashion all throughout 2012 (and into 2013) as if it were still a cyclical issue of needed reborn momentum. 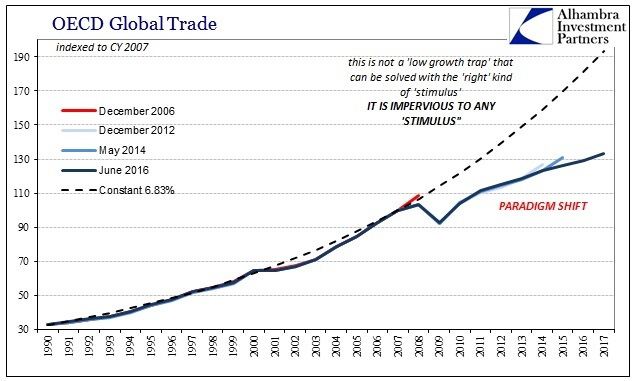 Instead, the global economy, as represented here in global trade, only continued to be unimpressed and unbothered by all “stimulus” fashions and quantities. 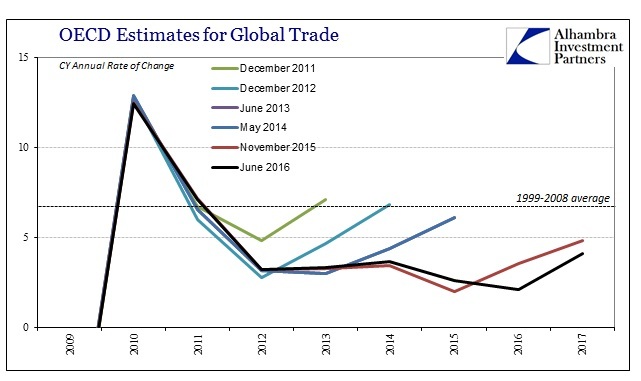 In the track of current estimates, there isn’t the slightest hint of all that global policy escalation in 2012 and 2013. The scale of the economic deviation is even greater than shown above, as the current estimated level of global trade for 2015 is only three quarters of what it “should” be under cyclical terms at the prior growth baseline. 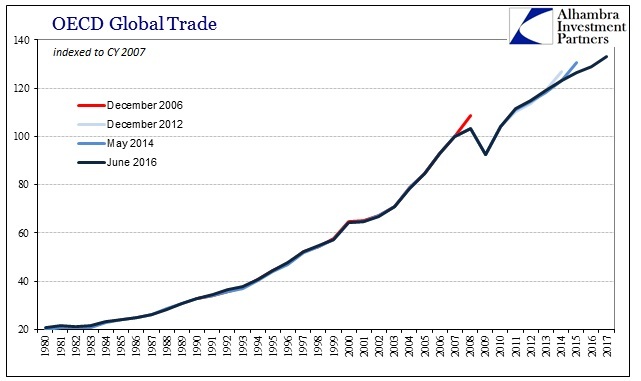 In only two years’ time, by 2017, this gap will expand to an unbelievable one-third shortfall (meaning that in 2017 global trade levels “should” be almost 50% more than even the optimistic estimates of right now) as the global economy falls further victim to the opportunity cost in lost compounding. The OECD figures total real global trade in both goods and services reached $22.4 trillion in 2015, leaving underperformance from that prior baseline of about $7.7 trillion. By 2017, total global trade “should” be $34.2 trillion but as of today is only figured to grow to $23.6 trillion. There is a lot of depression and social disorder in that “missing” $8 trillion and a great deal more at -$10.7 trillion. 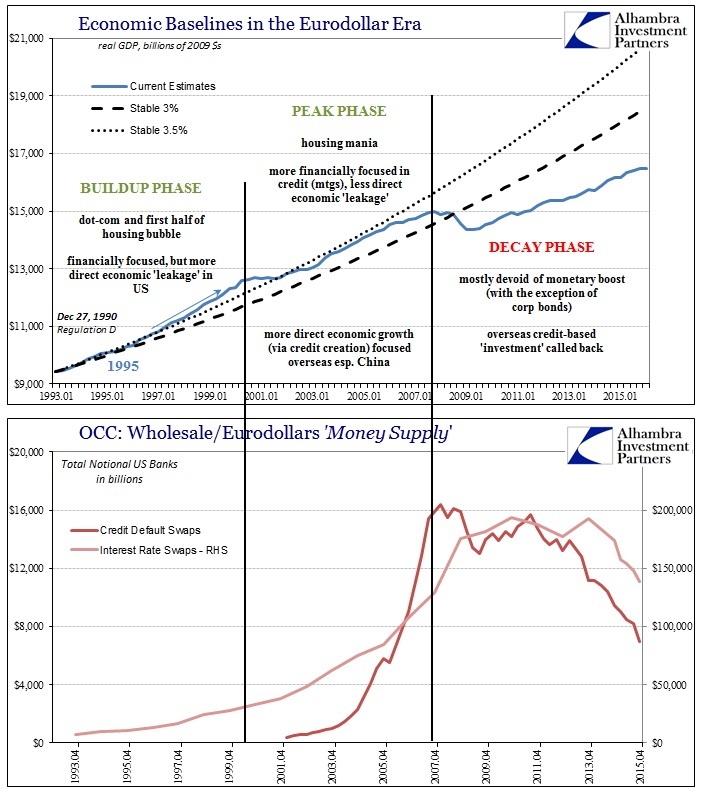 This is why there is suddenly a more direct appeal for new “stimulus” in the name of “the children.” The attempt to play upon emotion is yet another dodge, a prevarication to obfuscate so that the OECD or any orthodox economist and central banker can avoid having to explain all of this. Even if people aren’t aware of the massive scale of failure here, and they likely aren’t given that no media outlet seems even slightly interested in reporting on it, they can clearly sense that there is a great deal wrong with the economy and QE’s haven’t come close to living up to any expectations. In the end, there is only one possible way that global trade and global economies can be so synchronized in depression, and it is the one thing that orthodox economics cannot ever admit because it will undermine its own core assertions and assumptions. We are so far beyond cycle and stimulus, but to the economist there can be nothing else. The global economy has so clearly undertaken, and remains enthralled by, a monetary-driven paradigm shift, but the “discipline” of economics even after ten years of getting everything wrong flat out refuses to follow – for the children.